The science behind baseball and softball has demonstrated the success of an elite pattern of swing mechanics in both sports. This clinic includes 4 one-hour sessions for both boys and girls. Group size is limited to 6 players. These are 1 hour lessons offered at 5, 6, or 7pm running January 8th to April 26th in 2019. Please schedule the same time on both Tuesdays and Fridays. Class sizes will be limited. Coach Stan Oppedal uses a sequential teaching method, learning one movement successfully before moving on to the next, with direct body force on a power line form pitching rubber to home plate while using natural movements to prevent injury. He teaches all movement pitches and includes mental techniques to build confidence and competitive advantage. Coach Oppedal has personal experience as a long time men’s fastpitch pitcher and many years as a high school softball coach. He has coached several pitchers to All-Conference and All-State levels, including 2 pitchers in the IHSGAU Hall of Fame. 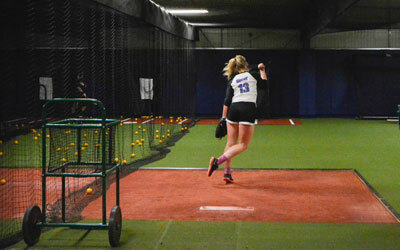 He has conducted many years of private softball pitching lessons and clinics for pitchers age 8 to 18. Catchers will be necessary once fundamental mechanics have been established by each pitcher. Catchers under the age of 19 are required to wear full gear. The Full Program January – April includes 30 lessons. There are 3 payment options available. Diamond level members receive a 25% discount.